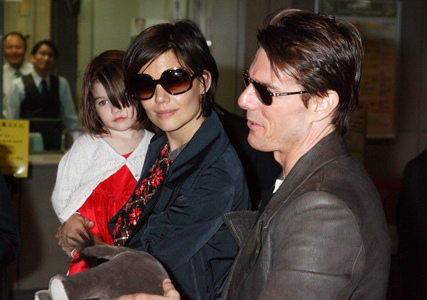 Tom Cruise, Katie Holmes and the adorable Suri touched down in Japan yesterday for their first family visit to the Far East. The superstar family arrived at Tokyo’s Narita International Airport after an 18-hour flight from the US on their private jet. As Tom greeted the thousands of screaming fans that had been camping out to catch a glimpse of the famous trio, Katie was given several cuddly toys for her super-cute daughter, including a baby elephant. Little Suri, however, seemed a little overwhelmed by all the attention as she nestled into her mum in an attempt to hide from the blinding flashbulbs, or maybe she was just embarrassed by her mum’s mismatched ensemble. After causing near pandemonium at the airport, the three of them hopped into a waiting helicopter, which whisked them straight to the roof of their glitzy hotel. It’s good to see the showbiz family travel in style!